Korn in Montreal or Quebec City? Inform me about the next events for Korn. Enroll yourself to our priority waiting list for Korn to be alerted when new tickets are available. Filling this form doesn't engage you to any purchase. Korn will be joining the Rockstar Energy Drink Mayhem Tour this summer. What this means is that the band will be performing at Parc Jean-Drapeau, in Montreal, on July 25th, 2010, with Rob Zombie, Atreyu, Hatebreed, Lamb of God and many more metal acts. Korn is aiming for June 2010 for the release of their 9th studio album. 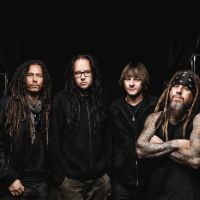 In over 15 years, Korn has sold over 30 million albums worldwide, in addition to winning two Grammy Awards for best metal record: Freak on a Leash in 2000, and Here to Stay three years later.